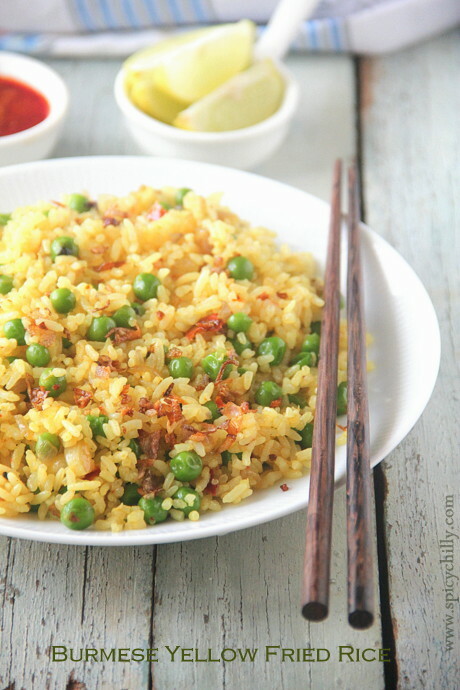 Spicy Chilly: Burmese Yellow Fried Rice with Shallots and Peas! 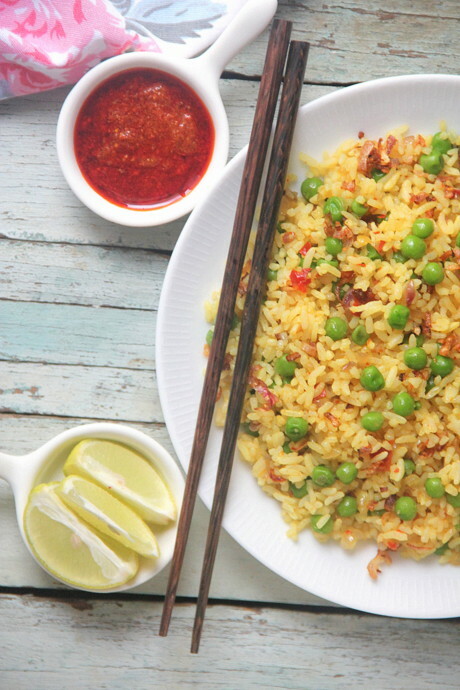 Burmese Yellow Fried Rice with Shallots and Peas! 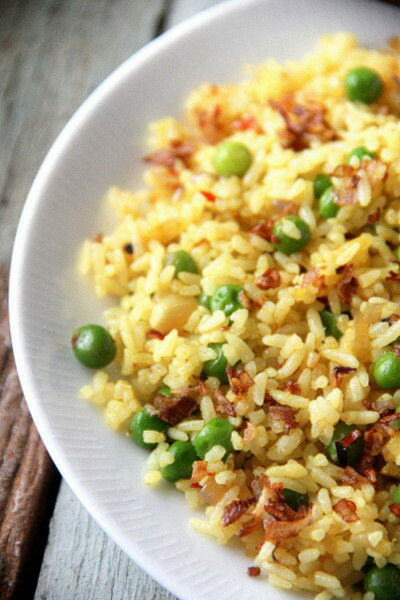 ellow Rice is a "Burmese thing." A heartwarming combination of turmeric, cayenne and fish sauce mingled with the irresistible flavour of caramelised onions makes this dish unique! 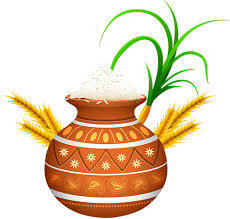 As you might know, the most common staple food in Myanmar is white rice, which is eaten by finger tips as morsels dipped in curries by the Burmese. The ingredients are fresh and resemble the Chinese mode of cooking. Inspired by the Indian cuisine, parallelly, they use lesser amount of spices and more of garlic and ginger. 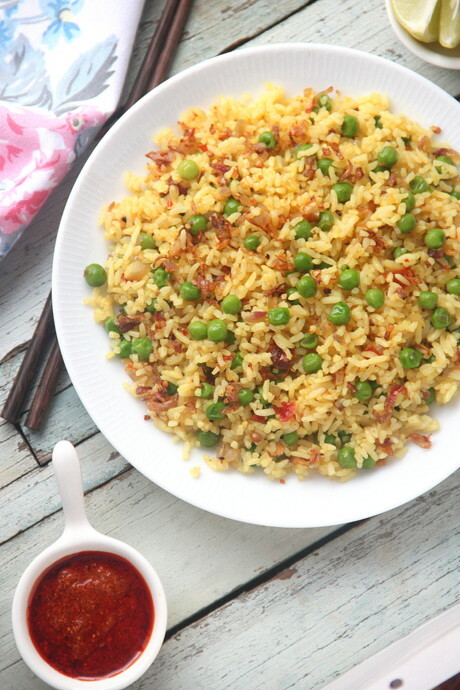 In this particular rice dish, I have used fresh peas along with fried onions and other basic Burmese ingredients. Fish sauce is avoided in the below recipe, as my family members are vegetarians. I strongly suggest to use this important ingredient, though! Heat oil in a skillet and throw in the shallot bits. Fry them stirring all the time, until crisp and golden. Drain in paper towel. Reserve for the last step/garnish. 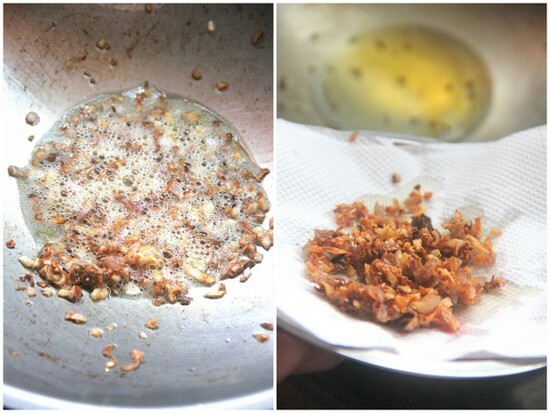 Thus, you will end up with 1.5 tbsps of shallot oil and 2 tbsps of crispy fried shallots. Heat the shallot oil in a large, wide skillet over medium-high heat.Add the shallots and cook, stirring occasionally, until the shallots have softened. Add the turmeric and cayenne and give them a quick stir. 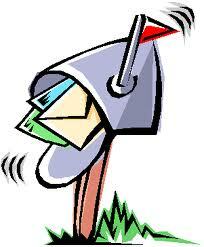 Crumble in the rice and give the mixture a stir, using the spoon to break apart any clumps of rice. Since I couldn't get hold of Jasmine rice, I used my regular parboiled rice. Add the fish sauce at this point if you wish to add and green peas. Cook, stirring occasionally, until the peas have cooked through and the rice is heated through. And again, since I used fresh peas instead of frozen ones, I cooked them in just enough water, separately and added along the rice. 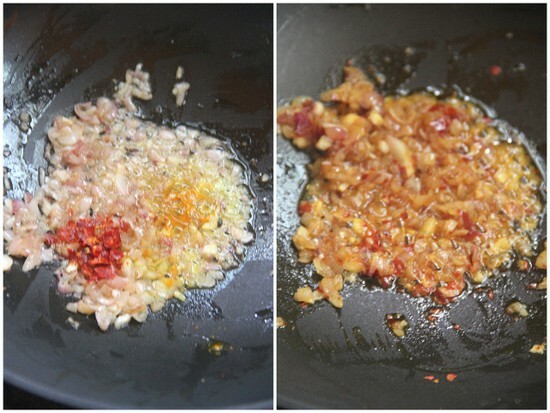 Add the golden crispy shallots and give the mixture one last stir. Taste and add salt, if necessary. Transfer the mixture to a serving bowl or platter and serve with lime wedges and hot chilly dip if desired.. Note: Fish sauce will have salt in it, so be careful when you add salt. 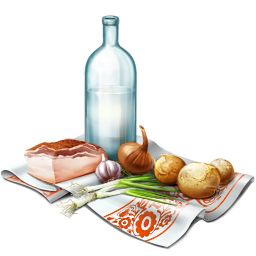 If you do not wish to add fish sauce for a vegetarian version, add the needed salt. 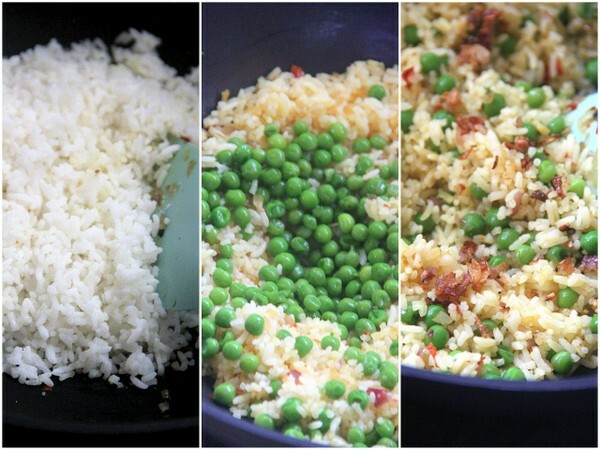 Simple and yummy one pot meal.. a bit different than the normal fried rice.